Morgan James Publishing, 9781683509172, 308pp. People going through a divorce or separation have only one wish: to be happy again. Happy Again is a powerful, step-by-step guide that provides a blueprint for a brighter, happier, more fulfilling future after a breakup or divorce. It's not enough for those going through a breakup or divorce to simply understand their emotions, reactions, and what caused their relationship to end. They need immediate, implementable action steps to move forward productively and consistently while in the midst of the chaos and pain of a separation. Happy Again is the definitive handbook for those going through a separation to get their life back on track. Eveline Jurry's proven Positive Separation Method(TM)provides a blueprint for disconnecting from the old life, and getting through each day with energy intact and a new, happy life in sight. 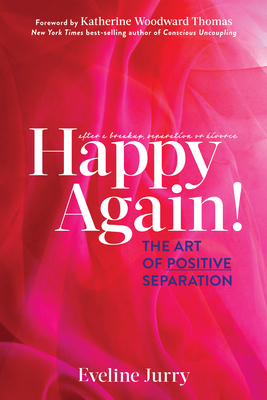 It is also full of interesting and motivational stories from well-known thought leaders including Marci Shimoff, Janet Bray Attwood, Chris Attwood, Lisa Nichols, and Debra Poneman, as well as Eveline's clients who have created their own Positive Separations.